Building roads, runways and landfills or preparing sites for residential and commercial construction projects typically require the use of high-quality, reliable paving equipment. Caterpillar® sets the industry standard for paving equipment design — you can trust a Cat® machine to handle your biggest jobs with speed and efficiency. 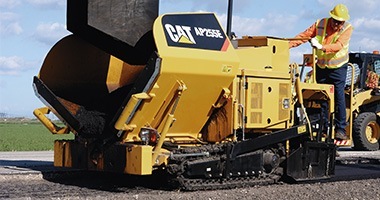 No matter the size, scope or difficulty of your paving application, there’s a Cat product that’s designed and built for the task at hand — you’ll be able to keep your projects on schedule and within budget. Call us today at (317) 803-2526 for more info on paving equipment rentals. Our paving equipment rental inventory can also include products from other leading manufacturers. Our knowledgeable rental staff can assist you in making the ideal match between machine and application. Our streamlined renting process will ensure you get your paver rental quickly — whether you choose to pick it up at one of our convenient locations or have us deliver it directly to your job site. You will find an assortment of late-model, low-hour machines that are thoroughly inspected and ready to perform at the highest level. Choose from a variety of flexible agreements to suit your time frame and fit your budget. We also back every rental with world-class support — including timely field service for on-site and emergency repairs. Renting a paver from MacAllister Machinery ensures a fast replacement for a machine that’s temporarily out of commission. With our next-day, and in many cases, same-day service, you can avoid lengthy interruptions that can bring your projects to a standstill. Renting also eliminates the often prohibitive storage and upkeep costs that come with equipment ownership. When you rent a newer paver, you get access to the most advanced technology that will help you complete more work in less time and with greater efficiency. And renting is an excellent way to “try before you buy” if you’re not quite sure whether to purchase a specific machine. 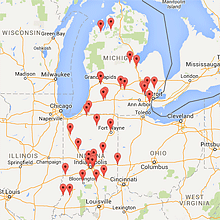 MacAllister Machinery has been serving the Indiana region with distinction since 1945. You can trust us for the best paving machines on the market backed by our legendary customer service. Take a minute to browse our heavy rental product guide to view our current paving equipment inventory. Feel free to give us a call or contact us online for additional product and pricing information.